A migraine is an intense, debilitating, and chronic headache that causes attacks on more than 15 days monthly. This type of headache produces severe pain on one side of the head, and some sufferers may even experience aura. Natural treatment is always an ideal approach, and this is where yoga for migraine relief can help. In general, exercises like yoga can help prevent migraine attacks by lowering stress levels, reducing inflammation, improving sleep quality, and more. Major migraine symptoms also include difficulty speaking, nausea, vomiting, tingling or numbness, and sensitivity to sound and light. Most migraine headaches last about four hours; however, if they are not treated or you don’t respond well to treatment, they can last anywhere from 72 hours to a week. Conventional migraine treatment will depend on a number of factors, including your age, how long they last, and how often you have them. Often, migraine medications include NSAIDs (non-steroidal anti-inflammatory drugs) and other pain relievers like acetaminophen (“Tylenol”). How Does Yoga Help Relieve a Migraine? How can you use yoga for migraine headaches? Some migraine patients complain that exercise triggers their headaches, so they avoid exercising and become less active in general. However, yoga involves slow, mindful movements that help alleviate stress, enhance mood, and reduce episodes of migraines and chronic tension headaches. It isn’t clear how yoga does this, but some experts suspect the parasympathetic nervous system (PNS) plays a role. This is because the PNS can lower blood pressure and slow one’s heart rate during yoga practice. As a result, the body is able to recover after stressful events, especially migraine attacks. A study published in the International Journal of Yoga in 2014 found that headache frequency and intensity was decreased in those who added yoga to their regular treatment. There was also an improvement in vagal tone, which is the effect produced on the heart when parasympathetic nerve fibers control heart rate. The researchers also found that yoga improved cardiac autonomic balance. Migraines are associated with disturbances in the autonomic nervous system (ANS) and circulatory system. When balance to these systems is restored, this is likely to reduce the risk of a migraine headache. There are specific yoga postures for migraine relief that help target stress and tension, which may be key contributors to your migraines. Certain poses can help improve blood flow to the brain and boost overall circulation. As a result, you may experience less of the pain and throbbing associated with migraines. Lotus position is a cross-legged yoga pose that calms the mind and reportedly alleviates health problems such as migraine headaches. It may also reduce muscular tension and control blood pressure. How do you perform the lotus posture? You will start by sitting on a yoga mat or the floor with your legs stretched out in front of you, while also keeping your spine erect. Next, bend the right knee and place it on your left thigh, and make sure the sole of your foot points upward and the heel is close to your abdomen. Repeat this step with your left leg. Both legs are now crossed with feet placed on the opposite thigh. You will want your hands on your knees in the mudra position—this is where the tips of the thumb and the index finger touch. Keep your head and spine straight, and continue to hold. Breathe in and out with long, gentle breaths. Pranayama is an ancient breathing exercise that involves consciously controlling your breath. It is beneficial for stress-related disorders, and could therefore help reduce your risk of migraine headaches. How do you perform this type of breathing exercise? You will start by breathing in deeply through your nostrils. You will feel your diaphragm move down, and this allows your lungs to expand while forcing the abdomen out. You’ll then feel your chest expand, with the collarbone rising last. Next, you will breathe out quickly through your nostrils. You will feel your collarbone dropping, and as your lungs collapse, your chest deflates and abdomen shrinks. When this is done correctly, your chest will expand when you breathe in and deflate when you breathe out. Repeat this continuously for five minutes. There is another beneficial breathing exercise for migraines called anulom vilom pranayama, or the alternate nostril breath. To start, close your eyes and focus your attention on breathing. Close your right nostril with your right thumb by simply pressing your thumb against your nostril. Next, you will inhale slowly through your left nostril. Remove your thumb from your right nostril, and use your ring and middle fingers to close your left nostril. Exhale slowly and completely with the right nostril, and then inhale through the right nostril. You will then close the right nostril and open the left nostril. Finally, breathe out slowly through the left nostril. Continue this breathing technique for 15 minutes. Kapalbhati pranayama is a more advanced breathing technique that helps reduce stress, and consequently reduces your risk of migraines. For this breathing technique, start by inhaling slowly through your nostrils until your lungs are full. You will then exhale through both nostrils forcefully. The contraction of your stomach muscles helps push air out of your body. Repeat this breathing technique for a 15-minute period. Standing forward bend is another beneficial yoga posture for migraine relief. For this pose, start by standing with your hands on your hips. Exhale and bend forward from the hip. You will want to lengthen your front torso as you move more fully into the posture. Next, with your knees straight, bring your fingertips to the floor. If this isn’t possible, cross your forearms and hold your elbows. Press your heels into the floor and lift your sitting bones toward the ceiling. With each inhalation, lift and lengthen your front torso, and when you exhale, release further into the forward bend and let your head hang. Stay in the pose for 30 seconds to a minute. To come up, bring your hands to your hips and press your tailbone down on the inhalation. Child’s pose is another yoga pose for migraine headaches that helps reduce pain and calm the nervous system. With this position, you start by kneeling on the floor while keeping your toes together and spreading your knees as wide as you can. Next, lower your buttocks onto your heels, and sit up straight. After exhalation, lean forward so your head and chest rest between your thighs, and allow your forehead to rest on the floor. Your arms should remain extended with your palms facing down. Hold this position for a minute or more, and release tension from your neck and shoulder. When you come out of the pose, push yourself up with your hands. Cat stretch is another useful yoga pose for migraine headaches. For this posture, come on all fours and form a table—with your back being the tabletop and your hands and feet forming the table’s legs. Keep your arms perpendicular to the floor, and look straight ahead. As you inhale, you will raise your chin and tilt your head back, while also pushing your navel downward and raising your tailbone. Hold this cat position and take deep breaths. As you exhale, drop your chin to your chest and arch your back, and relax your buttocks. Hold this posture for a few seconds before returning to the initial tabletop position. Continue for five to six rounds of inhales and exhales, and then come out of this posture. Seated forward bend may also help to relieve migraines. To begin this yoga posture, stretch your legs out in front of you while in a seated position. Also, keep your spine erect and toes flexed. Breathe in, raise both arms above your head, and stretch out. As you breathe out, bend forward from the hip, and have your chin move toward your toes. Place your hands on your legs and, if you can, take hold of your toes. When you breathe in, lift your head and lengthen the spine. While breathing out, gently move the navel toward your knees. Repeat this movement two to three times. Drop your head down, and breathe deeply for about a minute. Stretch your arms out. Finally, when you breathe in, come back to the sitting position, and when you breathe out lower your arms. Bridge pose will open your heart, chest, and shoulders. This posture reduces anxiety that may be related to your migraine headache. To start bridge pose, lie on the floor. Your knees should be bent with your feet flat on the floor. Next, extend your arms with your palms flat on the floor. You will then lift your pelvic region upward. Your head and shoulders will remain on the floor. To release the pose, drop your torso and pelvic region down slowly to the floor. Allow your knees to sink down until you’re lying flat on the floor. Downward-facing dog is a great yoga posture for increasing circulation to your brain, and this can help reduce your migraine risk. For this posture, begin downward dog on your hands and knees, and align your knees under your hips and your wrists under shoulders. Next, stretch your elbows and relax your upper back. Spread your fingers and press down, and gently lift your knees off the floor. Then straighten your legs, lift your pelvis, and lengthen your spine. You will hold this posture for about two minutes. Gently bend your knees and return to your hands and knees to come out of this posture. Corpse pose is also called savasana, and it is a great posture for relaxation. In this pose, you simply lie on the floor with your back on the ground. Spread your legs slightly apart, and place your arms to your sides with your palms facing up. Hold corpse pose for at least five minutes and as long as 30 minutes. Practicing yoga for migraine headaches can help relieve painful symptoms of the intense and debilitating health problem. 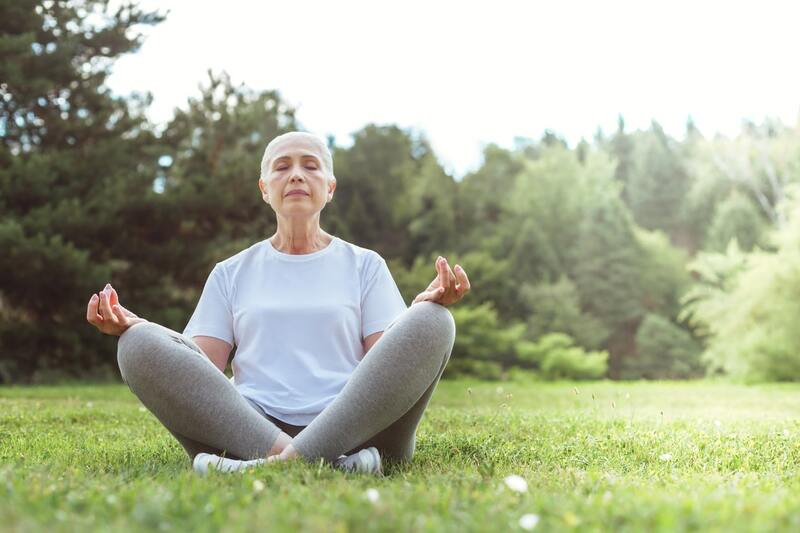 In this article, we explained yoga postures for migraine relief, which include lotus position, breathing exercises like pranayama and kapalbhati pranayama, standing forward bend, child’s pose, cat pose, seated forward bend, bridge pose, downward-facing dog, and corpse pose. Although these individual postures can help during a migraine, you may find it more helpful to add a full yoga practice to your daily routine. Just remember that while some people may find relief from yoga, others may not. In addition to yoga, you can try other natural migraine treatments geared toward getting enough sleep; managing stress; limiting screen time exposure; and eating a healthy, anti-inflammatory diet. Ginger for Migraine: Is this Natural Treatment Better than Drugs? Kisan, R., et al., “Effect of Yoga on migraine: A comprehensive study using clinical profile and cardiac autonomic functions,” International Journal of Yoga, July to Dec. 2014; 7(2): 126-132, doi: 10.4103/0973-6131.133891. “Padmasana – Lotus Position – Steps and Benefits,” The Art of Living; https://www.artofliving.org/in-en/yoga/yoga-poses/lotus-pose-padmasana, last accessed August 3, 2018. John, P., et al., “Effectiveness of Yoga Therapy in the Treatment of Migraine Without Aura: A Randomized Controlled Trial,” Headache, 2007, ISSN 0017-8748, doi: 10.1111/j.1526-4610.2007.00789.x.